If you like playing short-handed, hyper-turbo Sit & Go games, you should head over to Everest Poker where you can win a share of €12.500 each week. 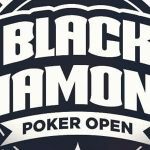 Short-handed, hyper-turbo Sit & Go games have really taken off in the two years since they were first played on the French poker site, Winamax. 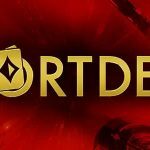 Practically every online poker site offers a variety of the format and, due to the games´ popularity, many online poker sites tailor their promotions around them. The games are popular for several reasons. Typically players can win up to 1,000 times their buy-in due to a random draw that takes place before each game starts. The games are also quick to play. Most are over in a matter of minutes, enabling players to squeeze plenty of action into a short session. Everest Poker is one of the bigger sites that provides the option of short-handed, hyper-turbo Sit & Go games. Everest´s version of the game is called Twister, and each game begins when three players have entered. Players start with 500 chips and rapidly increasing blinds, meaning there is no point in waiting for a premium starting hand – you have to get involved in the action from the very beginning. Twister is available at six buy-in levels from €1.00 to €50.00, and the random draw at the beginning of the game means that it is possible for a game with a €10.00 buy-in to pay out €10,000! 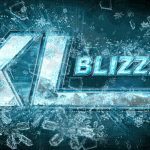 When the top prize is drawn, everybody shares in the prize pool – the winner of the game receiving 80% of the prize pool, while second and third each receive 10% of the prize pool. 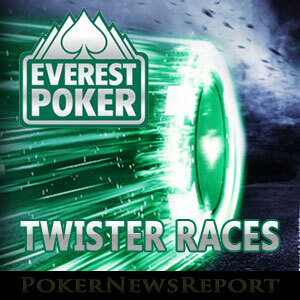 Everest Poker´s Twister Races are leaderboard competitions. Players are awarded points for each game they play and each game they win according to the buy-in. For example, players get one point for playing in a Twister game with a buy-in of €1.00, and an extra point for winning it. Players get two points for playing in a Twister game with a €2.00 buy-in, five points for playing in a Twister game with a €5.00 buy-in, and so on. 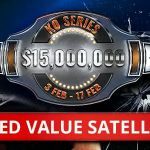 Being part of the iPoker Network, Everest Poker is also in the middle of its €100K Winter Wonder promotion – a promotion that rewards players for completing daily missions with a seat in daily and weekly all-in Shootout tournaments. From next week (19th December), the value of the prizes in the weekly all-in Shootouts increase from €5,000 to €25,000, so it will be a great time to be playing at the site. Furthermore, Everest Poker has one of the most generous (and easiest to clear) Welcome Packages among sites on the iPoker Network. Players making their first deposits are eligible for a 200% bonus up to €1,500, tokens for entries into the site´s €1K Series Tournaments and €10.00 in free poker tokens to try any of the games offered by Everest Poker. You could, if you wish, use the free poker tokens to enter the site´s Twister games – giving you at least ten points towards a good position on the Twister leaderboard. If you like playing short-handed, hyper-turbo Sit & Go games, there is no better place to play them than at Everest Poker.